In the middle of the world's largest comic convention, a cataclysmic event hits, obliterating everything within a five-mile radius of the convention centre. Five years later, reporter, Victor Lai, who survived the cataclysm, volunteers to go back into the convention centre and look for survivors. The Long Con is written by Dylan Meconis and Ben Coleman, and illustrated by E.A. Denich. The art is well executed and it's nice to see a bit of representation, in the form of the two major characters being Vietnamese and African American, respectively. I love the premise of this one, since comic geeks love thinking/talking about what we would do in the event of an apocalyptic event. The story is enjoyable, though it ends a bit abruptly. I think I've said that about the last three books in a row I've reviewed, so maybe abrupt endings are just the latest thing in fiction and we'll all just have to get used to it. 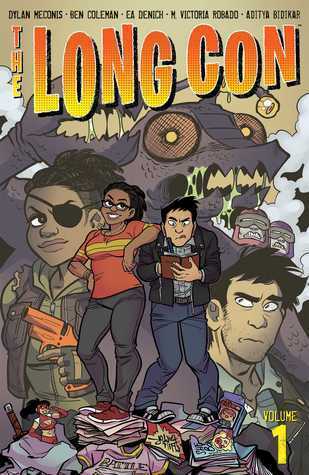 The Long Con is a fun comic about geek culture. It will be funnier if you've attended a comic or sci-fi convention, but it will likely appeal to anyone who is into comics or has loved ones who are. Disclaimer: I was given a complimentary copy of this book by Oni Press, via NetGalley, in exchange for an honest review.